The B883 road from the bridge over the River Varragill on the south edge of Loch Portree runs through the area and is part of the unofficial (not signed) Skye Trail. Bikers will have to return the same way. The Skye Trail continues off road from Peinachorrain along the side of Loch Sligachan to the campsite and hotel at the head of the loch. The route follows an old drove road. South of Peinmore, a short circular walk has been created through the old Gleannan wood and its township ruins. Ben Tianavaig (413m) gives outstanding views of Skye, Raasay and distant mainland hills, starting from Camustianavaig. 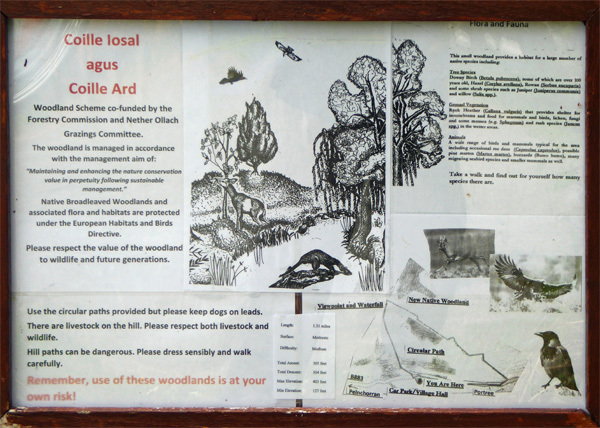 Braes Village Hall is a good starting point for the Coille Iosal woodland walk, part of which is alongside the Ollach River and its waterfalls. 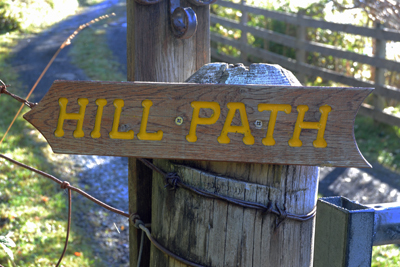 A path on the south edge of Gedintailor takes you to the shore, beach and An Aird. The point includes the remains of Dunan an Aisilidh. A return loop around the edge of the crofts will bring you back to the road in Balmeanach. Boats occasionally drop anchor overnight in the bay, Camas a Mhor-bheoil. A short walk to the shore next to the old church & school at Upper Ollach, which was used by the Napier Commission in 1883 (see the History page). North of Braes Village Hall, via a stile, a short trip to the coastal edge to find the remains of Dun Vlarveg. Alongside the Varragill River from the Braes Road bridge into Portree Bay and ending opposite the Aros centre on the A87. Be aware of tide levels. Devise a route to the shore at Camus Ban via the road from Peinmore to Penifiler. 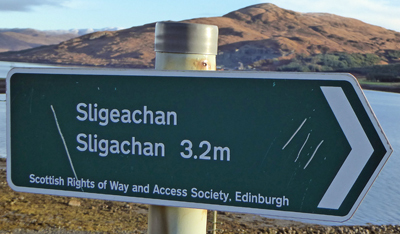 Take a look at the old settlements above Peinchorran and/or make your way to the top of Ben Lee. Make your own way along the shore/cliff edges from Peinchorran to Balmeanach Bay and the remnants of the old fishing station. The Isle of Raasay is a big part of the view from Braes and the ferry leaves from Sconser on the A87. If you want to leave the car behind, there are plenty of paths when you get off the pier in Churchton Bay.